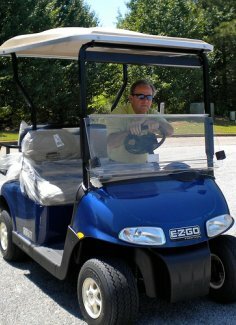 The EZGO golf cart manual can be found on line as a free PDF file if you are just looking for a general owners manual. If you are looking for a golf cart repair manual you will need to buy one on line at one of the golf cart on-line websites. 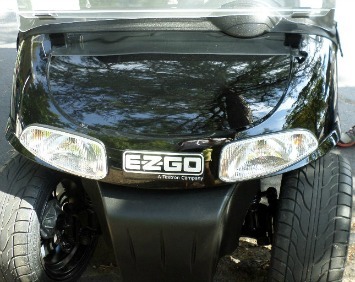 The EZGO golf cart owner's manual is available for free from the E-Z-Go website. You will need to know the make and model of your golf cart. This golf cart manual includes basic information like how to change the headlight or a fuse, golf cart battery charging, maintenance and service schedule and how to operate the golf cart. If you bought your golf cart used and do not have an owner's manual, I suggest you get one. However, this manual does not have any golf cart wiring diagrams or golf cart repair instructions. Click on this link and select your model for a pdf file that you can download for free and print from your computer. Golf cart repair manuals are essential if you choose to do your own gas or electric golf cart repair. Most golf cart dealerships don't carry them, but they can order one for you. You might as well do that yourself. If you want to purchase a hard copy EZ GO Golf Cart Manual you can find them on online, at E-Bay or sometimes a used copy shows up on Craig's list. Buying these golf cart repair manuals on line will cost you from $60 - $80 depending on the year, model and make of your golf cart. Be sure you have this information before making your purchase. Amazon carries some golf cart repair manuals. You can also try Buggies Unlimited or Everything Carts. I refer to my golf cart service manual frequently and wouldn't own a golf cart without one. So if you are a do-it-yourself kind of guy, spend the money and invest in a hard copy for easy reference. It will pay for itself in one repair.